YOUR VIP ISRAEL FAMILY TRIP! Win 6 Round Trip Tickets to Israel with VIP Service For Just $36.00! 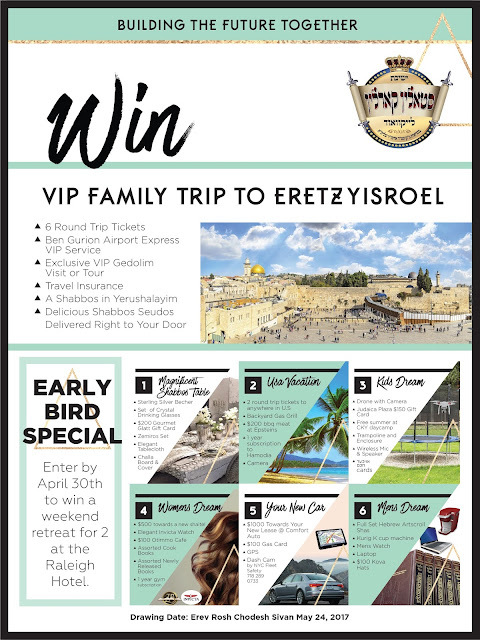 An Amazing opportunity at your fingertips: Win a VIP family trip to Israel, starting at $36! Trip includes airfare for 6, VIP Airport Service, VIP Shabbos In Jerusalem, and Exclusive VIP Gedolim Tour. Enter by April 30th and win a Weekend getaway for 2 at the Raleigh Hotel NY.